The 10 Best Zumba Classes in Iowa! Scientists and fitness experts would agree, the best type of exercise you can do is the type of exercise that is so fun that you don’t realize you are doing it. No better example of that can be found than in the many footsteps of Zumba. 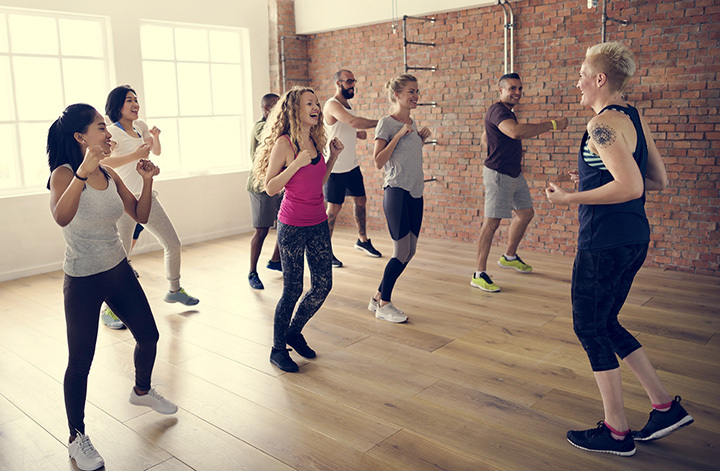 Filled with Latin-inspired beats, full-body movements, and enough moving around to really get a sweat going, Zumba classes are a sure-fire way to get your fitness going. From Sioux City to Bettendorf, you can find a Zumba class that is right for you. To get those bodies moving in the right direction, be sure to check out these 10 best Zumba classes in Iowa. Focusing on both the athletic side of fitness, as well as the mental, Body Moves Fitness is a privately-owned fitness studio in Coralville that offers many types of classes to enrich your mind, body, and soul. Featuring yoga sessions, dance classes, and a long list of Zumba courses to participate in, no matter the type of fitness you’re looking for, Body Moves has the right class for you. Featuring classes geared towards every level of Zumbalover, including the first-timer, Body Moves also offers a unique ZumbaToning course that utilizes Zumba toning sticks that add a little extra sculpting to the routine. If you are looking to spice up your boring workout routine, the Zumba classes offered by Zumba Fitness in West Des Moines can add that extraflavor to make exercising fun and entertaining to do. With each class instructed by the South American-born Eva Otanez, you can expect some Latin beats and full body movement no matter what level of Zumba athleteyou might be. For an electric good time while exercising, Zumba Fitness in West Des Moines is right for you. Featuring a long list of exercise classes, FIT Iowa City specializes in Zumba sessions that can really make you sweat. Featuring both regular Zumba classes and the exclusive Zumba Gold classes that cater towards mobility impaired individuals, no matter the type of athlete you are, FIT Iowa City has something for you. With each class instructed by certified trainers, and coming with a dance worthy soundtrack, at FIT Iowa City, it’s possible to have so much fun that you might not realize you are exercising. Alongside the long list of other fitness classes offered, Sisters Health Club in Cedar Rapids provides some of the best Zumba Gold classes you’ll find in the state. Geared towards seniors who want to stay in shape, Zumba Gold offers new takes on the traditional techniques of Zumba, while scaling some of the movements back to ensure everyone can enjoy the workout. While you’re checking out Sister’s Health Club, be sure to engage in the many other fitness classes offered by this local studio and health club. If you have any fitness or exercise goals you’re trying to meet, QC Simply Fit in Blue Grass can help you get there. That’s because including in the many different fitness classes offered in this neighborhood fitness center, the Zumba classes at QC Simply Fit can really get you moving, dancing and having a good time. With the combination of lively music, cardio and aerobic routines, and the friendly instructors to lead the way, QC Simply FIt might be the most fun way to exercise in the entire state of Iowa. With plenty of fitness classes ranging from yoga to spinning to Zumba, Fusion Fitness is the number one spot in Indianola to get your exercise on and add a little sweat to your normal routine. Locally owned and open 24 hours of the day, whatever type of exercise you are looking for, chances are you can find it at Fusion Fitness. Featuring multiple classes a week taught by different instructors, to see for yourself all the fun to be had at Fusion Fitness, check out this locally owned workout center yourself. With over 35 different fitness classes offered, Northland Fitness Club in Cedar Rapids has many different avenues for exercise that are fun to do. While the yoga classes and dance club cardio classes are worth noting, it’s the Zumba classes at Northland Fitness Club that keep everyone always entertained and moving to the beat of the music. Whether it’s your first time, or you are a Zumba pro, the friendly and facilitating facilities at Northland Fitness can help anyone exceed their own fitness goals. Featuring personal training, tennis classes, lap swimming and so much more, Life Fitness Center is the number one destination in Bettendorf to get your fitness on. On top of all the amenities offered by this friendly and welcoming fitness center, they also offer some of the best Zumba classes in the state. With different sessions offered throughout the week, and catering towards all levels of athletes, Life Fitness Center can help you meet your fitness goals, and have a fun time while doing it. As part of the larger Buena Vista Regional Medical Center, from every angle you look at it, this regional hospital and wellness center is interestedin your health. That’s why besides professional medical care, the Buena Vista Fitness and Health Center also offers some of the best fitness classes you’ll find in the state. Amongst all the exercise opportunities found, Zumba classes are on top of the list, and whether you’re well experienced or wanting to try it for the first time, the Zumba classes at Buena Vista Fitness are made for you. Serving as Iowa City’s largest and most complete athletic facility, North Dodge Athletic Club offers everything from lap swimming to tennis lessons, plus tons of group wellness classes including an invigorating Zumba session. Perfect for all abilities of athletes, perhaps the best part of theZumba classes at North Dodge Athletic Club is feeling a part of the athletic community that makes up this complete fitness facility. Nothing can quite top off your workout week like the Zumba classes at North Dodge Athletic Club, and to see what it is all about yourself, be sure to check out everything the North Dodge Athletic Club has to offer.